LXDE (Default) with filemanager PCMANFM 1.1.2, KDE 4.8.4 (boot option knoppix desktop=kde, DVD version only), GNOME 3.8.4 (boot option knoppix desktop=gnome, DVD version only). Wine version 1.5 for integration of Windows (TM) based programs. Virtualbox version 4.3.2 (DVD version only) and qemu-kvm 1.7.0 for (para-)virtualization. Linux Kernel 3.13.0 with cloop and aufs. Optional integration of the Tor network for anonymously surfing the web (DVD version only). Experimental support for UEFI-Boot (DVD: 32 and 64bit, CD: only 32bit) after installation on USB flash disk. A.D.R.I.A.N.E. (Audio Desktop Reference Implementation And Networking Environment) is a talking menu system, which is supposed to make work and internet access easier for computer beginners, even if they have no sight contact to the computers monitor. 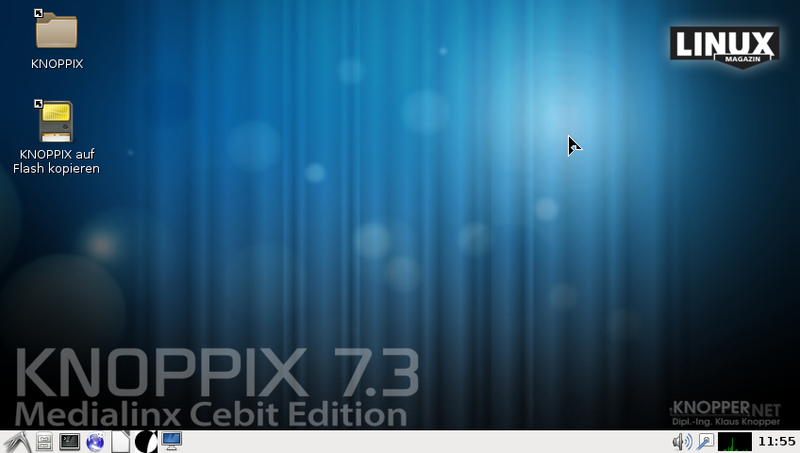 A graphical environment with also talking programs and arbitrary magnification using compiz-fusion, is another option. 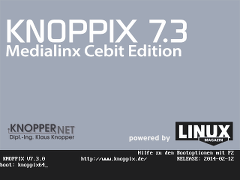 In order to create a bootable USB-medium (memory flashdisk, SD-card, digital camera with USB connector, cellphone with microSD, ...), the program flash-knoppix can be started from a running Knoppix system. This program installs all needed Knoppix files onto the FAT-formatted flashdisk, and creates a boot record for it. 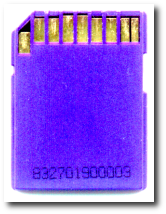 If desired, the target medium can be partitioned and fornatted, or left in its inistal state, so that existing files stay intact. 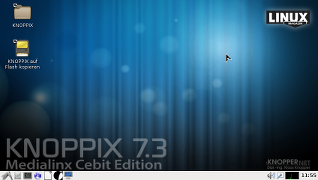 The KNOPPIX Live System starts and runs about factor 5 faster from USB flash disk than from CD or DVD! After having copied the system to flash, using the persistent Knoppix image (overlay feature), it is possible to also store files permanently in live mode. That way, personal settings and additionally installed programs survive a reboot. Overview of the most important functions. A complete description and listing of shortcuts can be found in the configurations of sbl, orca and compiz-fusion. 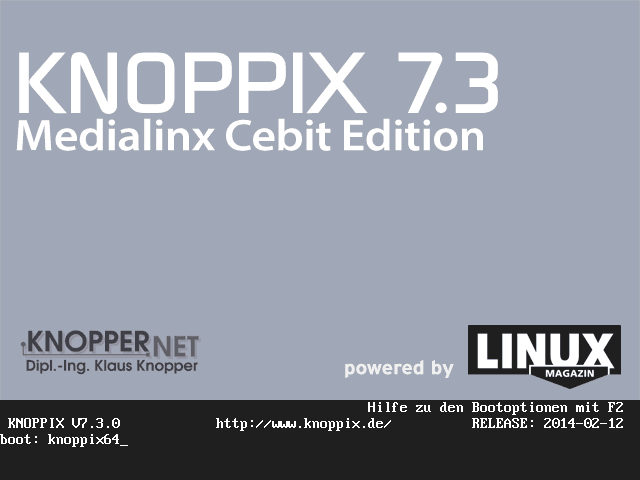 The CeBIT edition of KNOPPIX 7.3.0 / ADRIANE 1.7 is available exclusively in the march edition of Linux-Magazine and at the booth of Medialinx at CeBIT 2014, Hall 6, booth H08.